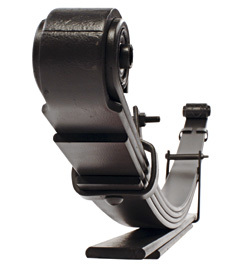 The leaf spring is one of the oldest forms of suspension, predating coil springs by many centuries. Since the middle of the 20th century, when coil springs in automobiles became ubiquitous, leaf springs have been found mainly in light commercial and 4WD vehicles, as the design of the spring allows the load to be spread more widely over the chassis. The Lesjöfors leaf spring range features over 250 parts, covering more than 70 different models and making it one of Europe's most comprehensive collections. Spring Design - Today, leaf spring design varies dramatically between multi-leaf and parabolic springs. Learn about the differences, and features & benefits, of both designs. Manufacturing - While based on a simple design, manufacturing leaf springs is a multi-part process, with variations in the manufacturing methods of parabolic and multi-leaf springs. Quality - Ensuring all Lesjöfors leaf springs meet the highest quality standards expected by our customers.